Here’s my Oscar recap, with a heavy emphasis on music, cause you know… it’s Music Monday. 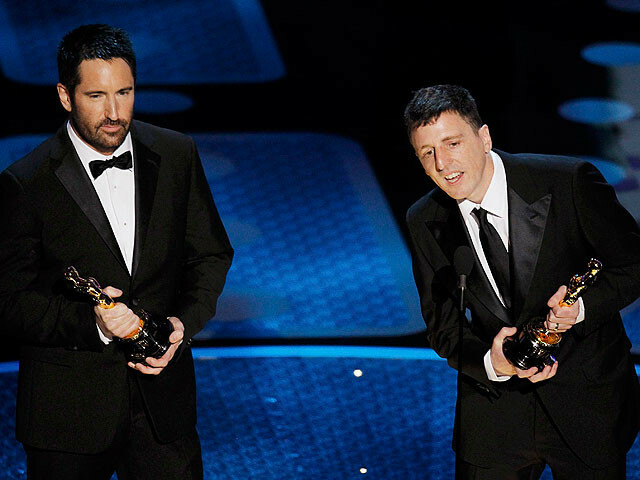 As one half of the duo that created the soundtrack to the movie “The Social Network” [the other half is Atticus Ross], Trent has achieved something awesome: a win at the Oscars. I admit to being extremely excited when they announced his name last night. And a very well deserved win. If you haven’t heard the soundtrack yet, you should. Even if you are not a fan of Nine Inch Nails, it’s very appropriate for the movie. And if you’ve not seen the movie yet, it’s out on video. A must watch, in this person’s opinion. Check out Trent with Oscar mainstays. He and Nicole look like prom dates in that photo. Original photo found over on Morrissey Solo. 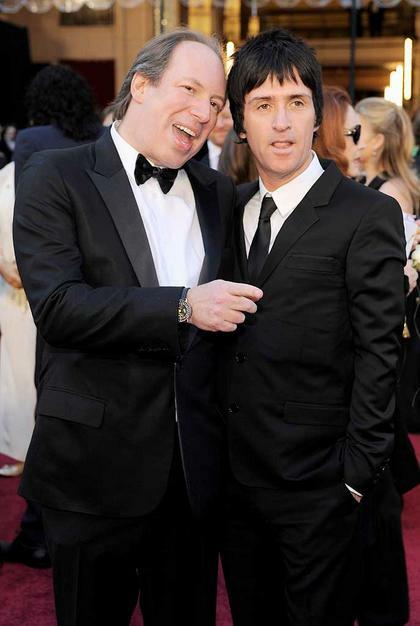 To add to the coolness of all things music at the Oscars, Johnny Marr showed up to the Oscars for his work on the soundtrack to “Inception”, alongside movie soundtrack veteran [and original member of The Buggles] Hans Zimmer. Both of them were the orchestrators of the great music that went along with one of 2010’s best movies. Those of us that are big Marr fans know his work from The Smiths, Electronic [with Bernard Sumner from New Order] and briefly with Modest Mouse. With Reznor and Marr at the biggest award show worldwide, it brings a rather great feel to this music fan. Knowing their works very well, it’s nice to see them both come into such a grand place in their careers. I can only hope that other alternative musicians will find their way into all that is Oscar in the coming years. The only dark musical note of last night’s award show was Randy Newman winning another Oscar for a song that sounds like all of the other songs he’s done for the Toy Story franchise. This year, the song was “We Belong Together” from “Toy Story 3”. I loved the movie [and it’s Best Animated Oscar win last night] and I’ve been ok with the songs he’s contributed. But there were so many other well deserving numbers, namely the song from “Tangled”. Oh well. Guess he’s an Oscar favorite at this point. For those that are curious from yesterday’s post, I picked 11 out of the 24 awards. From the top 8 awards, I picked 7 right [I really wanted David Fincher to win for Best Director], which is pretty close to previous years’ results. Couldn’t agree more with your Trent comments. Thoroughly well deserved. I had no idea Johnny Marr was there, nor did I know he was even involved with Inception. So how cool is that? I was equally surprised, in a good way. Always nice to see Marr branching out. Johnny Marr -how cool is that? And Trent – can go wrong with him. Randy Newman -seriously. He annoys me to death. Marr and Trent… making movies that much better. Randy Newman, on the other hand…. And don’t forget… Johnny Marr was half of the awesome dream team duo “Electronic” with Bernard Sumner from New Order! The first two Electronic releases are among my favorite albums of all time, and well worth checking out if you haven’t! Electronic was such a great band. Love them! I’ve got nothing against Randy Newman and was, in fact, surprised to hear him say that this is only his 2nd win. However, I find his non-winning “You’ve Got a Friend In Me” to be far superior to “We Belong Together”. I don’t have an opinion as to how the latter compares to the other nominees this year. You know, I can’t fault Newman too much, as I really do connect with the Toy Story movies, but it all seems to be a retread in some ways. Which is why I really liked Sarah McLachlan’s song she did for Jesse in Toy Story 2. Different and touching. Funny. I feel the same way about the TS3 song but just never really thought about it until reading this. Katie and I developed a new respect for the Tangled song after discovering it was actually Zachary Levi singing it with Mandy Moore. We had no idea he could sing. That Tangled song is quite good. And I’ve appreciated how Mandy Moore has gone from a teeny bop pop star to doing some incredible work in movies.